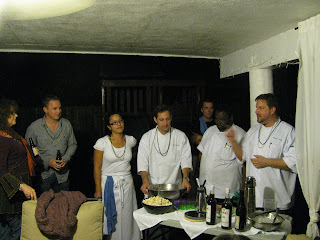 As the group filtered in and huddled in the covered patio waiting for the rain to blow over, the chefs got everyone started with some creole kettle corn and a Pimm's Cup. The Pimm's Cup is a traditionally English drink that has found a second home in New Orleans, made with Pimm's No. 1 (a gin-based liquor infused with fruit juices, spices and aromatics) typically mixed with lemon-lime soda and always garnished with a cucumber slice. K and Chad put their own spin on it by mixing it with a cucumber and lemon syrup which carried a wonderfully fresh, vivid flavor. And the kettle corn, spiced up with some Zatarain's Creole Seasoning? Where was this during the Super Bowl? I could have put away a big bowl by myself, especially with a few of those Pimm's Cups to wash it down. 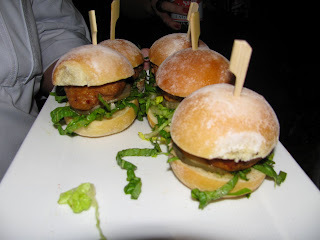 The chefs mixed things up with a combination of stations and passed foods, so with my hand still sticky from kettle corn, I grabbed one of these sausage sliders. The house-made sausage was spicy and oozing warm red oil like good chorizo - a hot mess in the best possible sense. 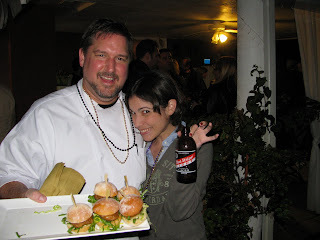 Here's Chef Kurtis passing around the sliders while Jackie Sayet (of Kitchen Interviews and the genuine kitchen and, less frequently these days, Short Order) makes like she's in a Red Stripe ad ("Hooray Beer!"). 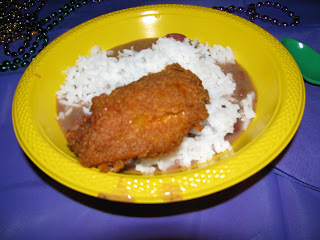 Next up, Chef Mike (a/k/a Big Basco) went old-school with a classic rendition of red beans and rice, along with another of his specialties: fried chicken. This was perfect fried chicken, with great crispy skin encasing juicy, tender meat, billowing steam once the skin was broken. The red beans and rice were generously studded with sausage and big nuggets of ham hock, though I longed for a big dash of Crystal to turn up the heat a little more. 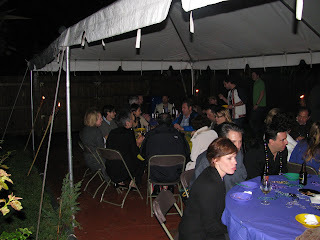 Everyone gathered under the tent to warm up and chow down. The menu stuck to the traditional theme for the next round, with a good old fashioned crawfish pie. This one is so deeply ingrained that it's in a famous song: "Jambalaya, crawfish pie and a tasso gelato ..." Is that not how it goes? That's how it goes when you're doing it Cobaya style. As the chefs explained, Heston Blumenthal was one of the first chefs to start playing with savory ice creams, and his bacon and egg ice cream is now iconic in contemporary cuisine. 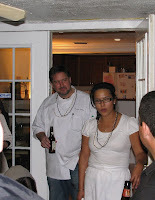 Chefs K and Chad have been playing with the idea for some time, and more than a year ago I had a fantastic chorizo ice cream that they had done for a "Paradigm" dinner at the restaurant. 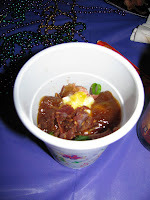 The tasso gelato was just as good, a surprisingly successful merger of smoky, meaty flavor and cold, creamy texture. It was also a great accompaniment to the delicious crawfish pies, whose pastry crust rode a perfect balance between crispy and tender. Pie a la mode. This is exactly what I've repeatedly found that Chefs K and Chad do so well: a merging of contemporary techniques and concepts with rock-solid foundational technique and flavor. 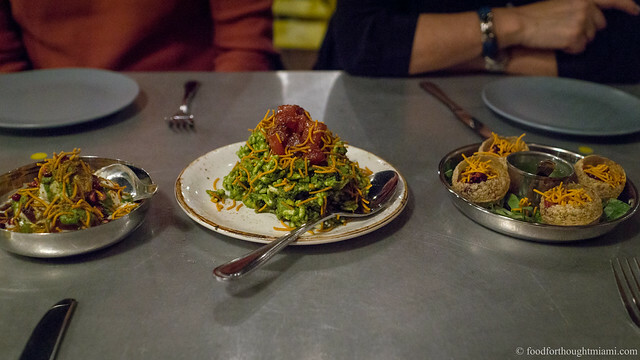 The next course provided another twist on a New Orleans tradition, though one that is mostly only known to locals: yakamein (a/k/a ya ka mein, yat-ca-mein, yat ka mein, and any other number of possible variants). The origins of yakamein are murky, even to New Orleans natives. Chef Mike gave a lengthy history and explanation, of which I have only a fuzzy recollection (he lost me when he said something about "vegetarian yakamein"). There's not much out there on the subject, and Chad's explanation on his blog is about as good as you'll find. The typical rendition, which can be found in Chinese restaurants, po'boy shops, soul food joints, and neighborhood grocery stores, involves noodles (spaghetti), a soy-based broth, scraps of meat, a hard boiled egg, and green onions. As is typical, K and Chad made it their own with a unique cold "noodle salad" version. Their take on yakamein used soba noodles, ham, braised shortrib, pressure-cooked beef tendon, 66°C "egg salad," (a cooled version of the luxuriously silky texture of an immersion-circulator cooked egg), a jellied soy beef broth, crispy jamon, and green onions from Chad's garden - served, as is customary in New Orleans, in a big plastic cup. They jokingly (I hope!) called this a "refresh" course. It was hardly light at all, rather the flavors and textures were rich and dense, and possibly even more vivid when served cold. This - like the original - would make fine ballast for a long night of drinking. The chefs next started working basically like a three-ring circus. 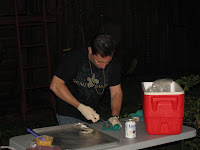 Chad was shucking oysters, Mike was passing around crispy fried shrimp topped with a lemon-green Tabasco gel, and Kurtis was under the tent, talking gumbo consommé and crawfish bread. We'll follow up on those oysters momentarily. 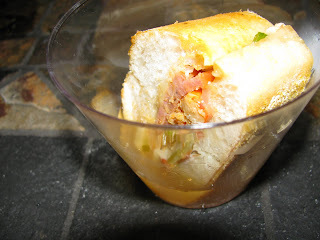 In the meantime, let's get back to gumbo consommé and crawfish bread. A consommé, traditionally, is clarified using a "raft" of egg white which filters out all the impurities in the liquid, leaving a clear, vividly flavored broth. Gelatin clarification, as well-explained by the master Harold McGee, uses gelatin and freezing to "trap" the flavors of a broth or other liquid in a clear, purely flavored liquid. Here, the chefs used the technique to capture all the flavors of a seafood gumbo in a golden translucent comsommé. 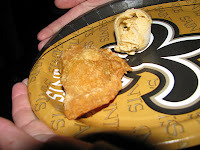 Crawfish bread, meanwhile, is yet another New Orleans tradition, and more particularly, a Jazz Fest tradition, featuring crawfish tails and cheese warmed up in some toasty French bread. This particular iteration was about a five-way culinary mashup, starting with the basics of crawfish, cheese and crusty bread, adding in some sausage (because everything's better with a pork product), confited quail (some freezer-preserved remnants of last month's "Blind Quail"), and Boscoli olive salad (a muffuletta essential), all destined for dunking in the consommé, French dip style. It all worked. I went back for seconds. Back to the oysters. 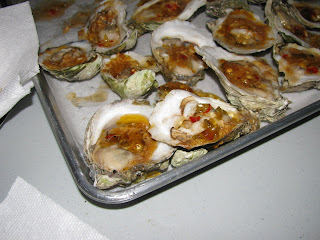 After enough had been shucked to cover a tray, they were topped with a garlic butter (with a bunch of other good stuff in it) and put on Chris' BBQ over low slow heat for about twenty minutes - just enough to melt the butter and barely warm the oysters - then topped with a hot pepper jelly. 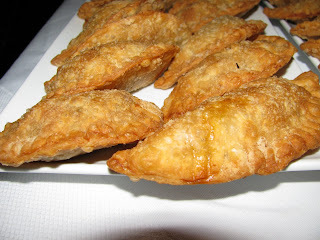 Briney, buttery, smokey, sweet, spicy - these were crazy good. I planted myself by the oyster table and waited patiently for everyone to take one or two, then once a sufficiently polite interval had passed, had myself about a half-dozen. I saw other people go back for another, even after dessert. Now it was our host, pastry chef Jenny Rissone's, turn to shine, and she started off the sweet phase of things with a cafe brulot bread pudding (sorry no pictures, inhaled it too fast). Jenny, who started in Miami at the Trump with Kurtis and Chad, and has been executive pastry chef at a couple big local resorts, now runs a business, Pastry is Art, out of that converted garage. I don't know that Jenny's been to New Orleans, but she's clearly a quick learner. 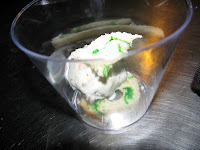 The bread pudding, drizzled with a spiced coffee syrup, was right on target, and was followed by a clever and colorful king cake ice cream with crown cookies. As a finale, Jenny brought out some pralines which had been infused with a bit of bourbon, which turned out to be just about perfect, because some of us happened to have brought some bourbon along. Sipping some Evan Williams and Eagle Rare, and nibbling on some pralines, was a perfect way to close out the night. I am hugely grateful to all of the chefs who helped make Cobaya Gras happen - Kurtis Jantz, Chad Galiano, Mike Marshall, Jenny Rissone, and Chris DeGweck, who was like a utility infielder all night doing everything that needed to get done (including figuring out how to turn off the sprinklers when they went off right as the rain started to let up!). I am also very thankful to my co-conspirators, Chowfather and Blind Mind, who were instrumental in both the inspiration and execution of Cobaya Gras. 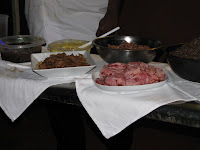 But most of all, I am gratified and humbled by the incredible support that my fellow Guinea Pigs have shown for the chefs and for these dinners. 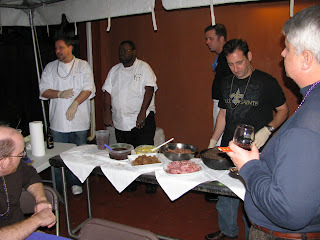 When we first started talking about "Cobaya Gras," I envisioned something almost exactly like this past Friday's event (though without the rain): something casual and laid back, more like a party than a sit-down dinner, with some creative, serious but fun, New Orleans style food. Personally, I'll happily eat off a paper plate, leaning on a rickety stool, if the food is on point. It's great to have found so many people who feel the same way. I hope everyone enjoyed Cobaya Gras as much as I did. Maybe we'll make it an annual event. I will confess now that when we announced the event a week ago, we had not yet nailed down a location. Wish we had gotten some of these for the festivities. When Chad asked legendary New Orleans food critic Tom Fitzmorris about it, his response was "I cannot think of a dish less worthy of serious research than this one" (though he's apparently come around on that view more recently). For some more reading, look here or in Sara Roahen's book, Gumbo Tales (do a "Search Inside this Book" for "ya-ka-mein" and then go to page 202). Her introductory anecdote on the subject of ya-ka-mein is of asking a New Orleans woman about the dish, to which she responded, "You mean ghetto pho?" Here's also a snippet of an interview with New Orleans Chef Leah Chase on the subject. David, you are truly gracious. Thanks for the tip on the Saints issue Crystal hot sauce! Kurtis and I are going to order a case and split it. None for Mike though. He's an undercover Pittsburgh fan for some strange unknown reason (and the only one of us actually born and bread in inner city New Orleans). Wonderful recap Frod! Loved being there... great food in great company... can't ask for more! incredible logistical feat, and what a feast and fest. 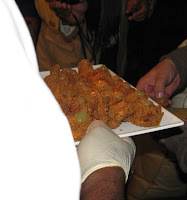 The chefs really captured the spirit of nawleans all stuffed inside the cobaya casing. Perhaps an underappreciated benefit of your great blog is instead of having to tell everyone the play by play of the meal, I just send people here for one-stop food envy! 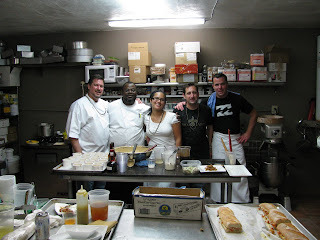 Kudos again to you and much love to the tag team chefs, the food, the crowd and the place were perfect.